Sherman and Leroy love sweet potato dog chews. They love them so much that I have spent a small fortune buying them bags of sweet potato chews from the store. Then one day the light went on my head. It’s just sweet potatoes. It’s a single ingredient treat. Why am I buying these and not making them? So for the past few months that has been what I’ve been doing. 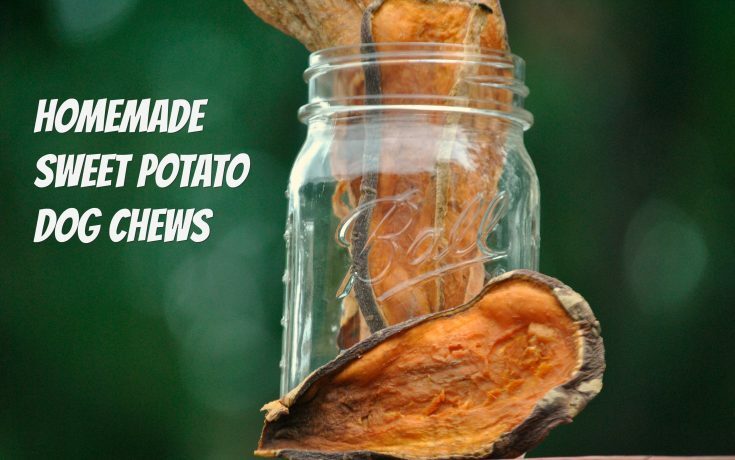 It’s so easy and if your dog likes sweet potatoes you should give it try! Slice them up. The way you slice them is up to you. I slice them lengthwise to get bigger, longer chews but you can cut them widthwise if you want more of a round chip size. You can even cut them into french fries if you want! Go crazy! The thicker you cut them, the chewier they will be. I cut them about 1/4 inch. Because sweet potatoes can be hard to cut I always cut a slice off the bottom so it’s more stable on the cutting board. Place on cookie sheet and bake for 3-5 hours, flipping them over halfway through. If you want a crunchier chew, leave them in 20-30 minutes. I normally bake them for 3 hours and then leave them in the oven while it cools. 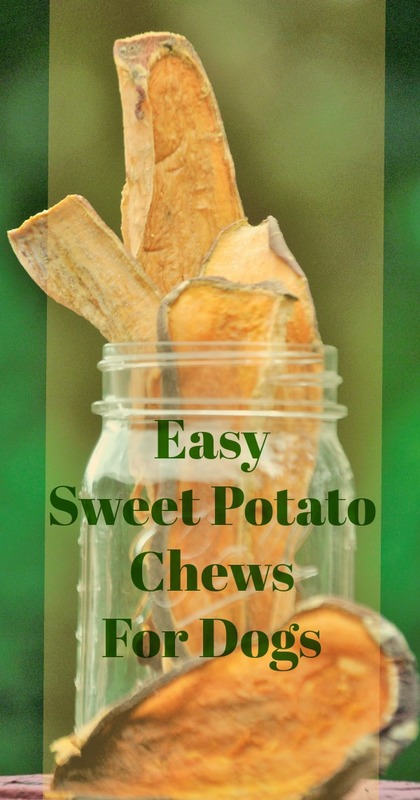 After they cool, sweet potato chews can be stored in an airtight container or Ziploc bag and placed in the fridge for about 2 weeks. They can be frozen for a few months! The small bag of sweet potato dog chews that I buy from the store costs $15. I bought 2 sweet potatoes for $4 and got more chews! Leroy likes hard, crunchy things but Leroy can’t have things like bully sticks because they are too high in fat and protein. These give him a healthy treat that he can crunch on. Sherman just loves them. Sweet potatoes are an excellent source of potassium, manganese, and magnesium. They also contain calcium, iron, and zinc and are low in sodium. Sweet potatoes are high in dietary fiber which is good for digestive health. They are low in fat and are rich in beta-carotene. Sweet potatoes contain Vitamins A, C, E, and B6. Slice them up. The way you slice them is up to you. I slice them lengthwise to get bigger, longer chews but you can cut them widthwise if you want more of a round chip size. You can even cut them into french fries if you want! 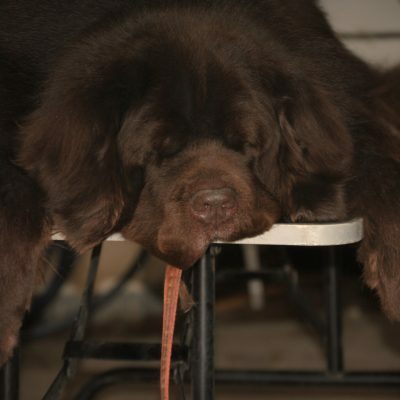 The thicker you cut them, the chewier they will be. I cut them about 1/4 inch. Because sweet potatoes can be hard to cut I always cut a slice off the bottom so it’s more stable on the cutting board. You can cut the sweet potatoes anyway you would like, just remeber that the thicker they are the longer they will take in the oven. 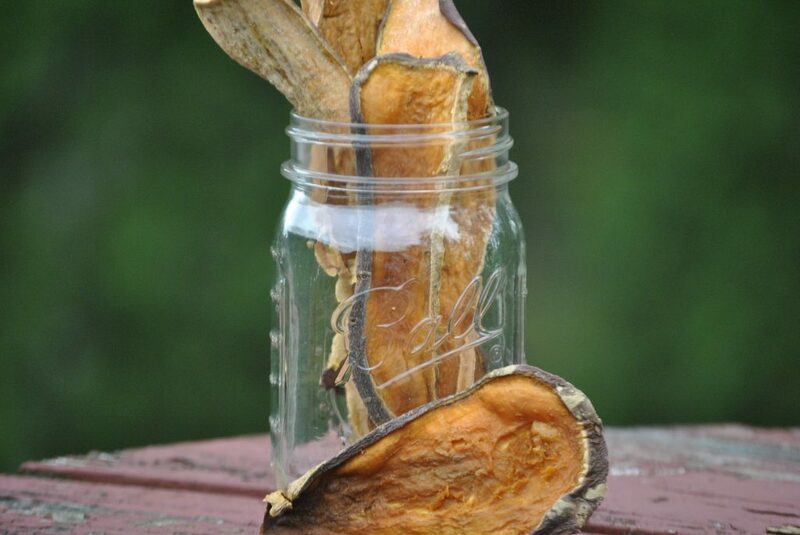 Does your dog like sweet potato chews? Have you ever made them? As with any food, we always recommend that you speak to your veterinarian before adding it to your dog’s diet. 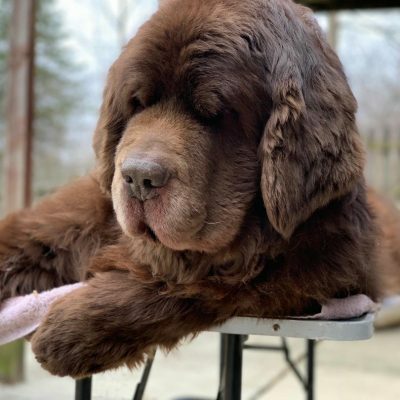 « Big Face Newfie T-Shirt Giveaway! I’m not a sweet potato fan, but Bailie loves them. Mom made them for her and Bailie one time and they thought they were amazing. So easy to do! I’m not a fan either and Sherman use to not be, but Leroy has always loved them and now Sherman does too! We use a dehydrator that I’ve had for 30+ years. So easy, so inexpensive. I always ask myself ‘why didn’t I think of doing that sooner?’ when I finally realize I could be saving some cash on a tasty treat. True confession…I like them myself as much as Sam does especially since they are good for both of us. ? A dehydrator is on my wish list! I want to dehydrate all things! I’m going to try these for the dogs because they LOVE sweet potatoes. Let me know if you do! I hope they like them as much as Sherman and Leroy do! I got a food dehydrator for Christmas two years ago so I could make my own treats for the girls. Guess what is still sitting on the floor of the pantry closet, unused? Oh well. The girls love the sweet potato chews, but I stopped buying them b/c the ones I was buying were reportedly toxic (Drs. Foster & Smith). And right around that time, all 3 girls were having digestive issues. It was when Ducky’s issues started. Maybe now, 2 years later, she and Shadow could handle one or two a week. I’ll have to ask the vet next time I see him. I have read that if you give them often, they can cause diarrhea so that’s why I keep to a few times a week. Thanks Jen! I’m always looking for homemade treats for Moses and Jordan. Especially healthy, low fat, low calorie treats for Jordan who is a bit of a curvy girl. Moses is a bit of a challenge because he’s a very picky eater. The sweet potatoes are in the oven now so we’ll see how they go over. Perfect! Let me know what they think of them! Jordan loved them but she’ll eat anything (which explains the “curvy girl” syndrome). Moses wasn’t too sure and just stood there with it in his mouth so Jordan couldn’t get it. He’s coming around slowly which is typical for him. 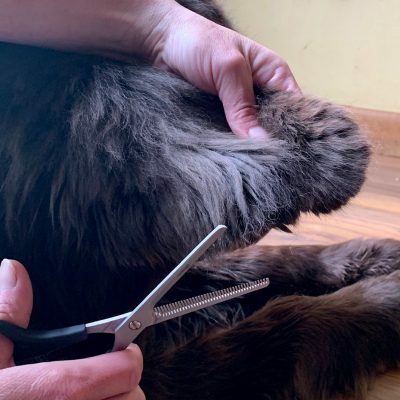 That’s one Newfie who hates change, even treats. I love them because they’re so economical and easy! That’s exactly how it is here! Leroy loves them but it took Sherman a few tries to get into them. Now he drools over them! Next time I make them I’m going to sprinkle a little cinnamon over them and see what they think! What a great idea for a dog new treats!!! Looks yummy. I am going to try it with my dog. Thanks for sharing!!! They are just so easy and the boys love them! I hope your dog does too! It is look yummy and quite easy to make. Thank you very much for useful sharing. I am going to try this chews for my dogs.